India is turning fashionable, and what’s more, it is starting young. Unlike previous generations when only a select few included fashion in their daily choices, today’s world is one where almost every person is into fashion. Today’s fashion is not just about wearing trendy clothes but also the knowledge to accessorize and blend fashion with one’s own taste, all at the same time. A leading fashion portal like Myntra cannot but be elated at this change. Anant Narayanan, CEO, Myntra & Jabong, in an interview with CNBC, said that fashion and lifestyle are undergoing a major transformation in recent times. In fact, he went so far as to describe fashion as having emerged as a culture. The reasons for this, elaborated Ananth, was fashion becoming one of the best forms of self-expression; the modern Indian woman becoming aware about what she wants to do; and existing biases getting better. Making Myntra a daily habit for women was a task they had undertaken, shared Ananth. What better example than Deepika Padukone’s All About You when it comes to a clothes brand created to give the wearer the freedom to actually wear what one wants, be it in the material that best suits the Indian weather, or having the choice of wearing western as well as Indian (which not many brands offer) and also being one of the most affordable brands in fashion, costing just between Rs 800-Rs 4000. As Deepika Padukone shared in the same interview, when she initially thought of launching her own clothesline, it was to give expression to the girl inside. But her passion soon evolved into the idea of empowering girls and women, from age 15 to age 40, by giving them the right to find their preferred fashion within this brand. Deepika said that fashion was an extension of a person’s personality and it truly came into fruition when one had the liberty to wear what they wanted to at home, work or any social setting without any peer pressure. Talking of her Spring-Summer collection launched recently, she said it had softer and lighter fabrics, lace, florals and pastels, with comfort being the key word. Deepika also emphasized that knowledge and acceptance of one’s own uniqueness is key and it is upto each one of us to mould it into our strength. Only then can a person drive out the irrelevant and embrace themselves. All About You has also proved to be one of the top five women’s wear brands on Myntra, and among the top ten on Jabong, according to Ananth. 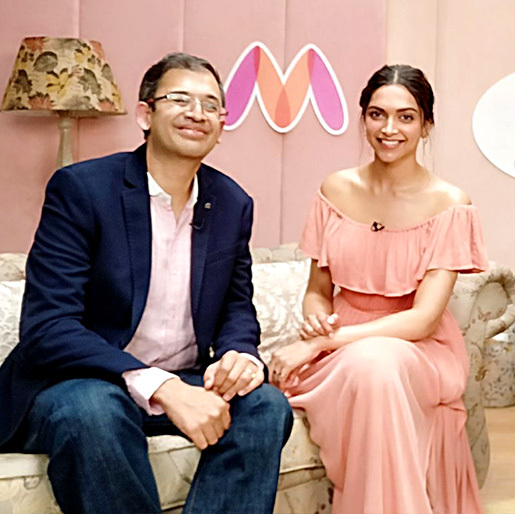 The unique partnership of Deepika and Ananth, one an actor and the other a businessman, can be credited with the success that All About You has seen in the online retail space. By making the brand a lot more accessible to a larger audience, by endorsing simplicity as well as pizzazz, All About You has reduced the isolation that a lot of brands create by catering to specific trends and audiences. As Deepika has stated, it is all about exploring and embracing your true self which would in turn reflect in one’s style and clothing, the idea on which All About You is based on. As a matter of fact, Deepika based the idea of the brand based on her own mother’s elegant and relatable fashion which inspired her. All About You has seen good growth in recent years. With a Year on Year growth of 150%, it’s no surprise that the brand is so hugely successful and will continue scaling higher in the foreseeable future.